Definition at line 48 of file AMDGPUSubtarget.h. Definition at line 50 of file AMDGPUSubtarget.h. Definition at line 144 of file AMDGPUSubtarget.cpp. Definition at line 242 of file AMDGPUSubtarget.h. Definition at line 692 of file AMDGPUSubtarget.cpp. References llvm::Triple::amdgcn, llvm::Triple::getArch(), llvm::MachineFunction::getSubtarget(), llvm::MachineFunction::getTarget(), and llvm::TargetMachine::getTargetTriple(). Referenced by llvm::AMDGPUMachineFunction::AMDGPUMachineFunction(), llvm::AMDGPUTargetLowering::analyzeFormalArgumentsCompute(), llvm::createSIWholeQuadModePass(), llvm::AMDGPUTargetLowering::getImplicitParameterOffset(), getReassignedChan(), INITIALIZE_PASS(), isCallPromotable(), and readsVCCZ(). Definition at line 699 of file AMDGPUSubtarget.cpp. References llvm::Triple::amdgcn, F(), llvm::Triple::getArch(), llvm::TargetMachine::getSubtarget(), and llvm::TargetMachine::getTargetTriple(). Definition at line 197 of file AMDGPUSubtarget.h. Referenced by getKernArgSegmentSize(), and llvm::SIMachineFunctionInfo::SIMachineFunctionInfo(). Default range flat work group size for a calling convention. Definition at line 269 of file AMDGPUSubtarget.cpp. References llvm::CallingConv::AMDGPU_CS, llvm::CallingConv::AMDGPU_ES, llvm::CallingConv::AMDGPU_GS, llvm::CallingConv::AMDGPU_HS, llvm::CallingConv::AMDGPU_KERNEL, llvm::CallingConv::AMDGPU_LS, llvm::CallingConv::AMDGPU_PS, llvm::CallingConv::AMDGPU_VS, getWavefrontSize(), and llvm::CallingConv::SPIR_KERNEL. Definition at line 427 of file AMDGPUSubtarget.cpp. References llvm::AMDGPU::HSAMD::Kernel::Arg::Key::Align, llvm::alignTo(), llvm::CallingConv::AMDGPU_KERNEL, Arg, llvm::Function::args(), assert(), llvm::Function::getCallingConv(), llvm::Module::getDataLayout(), llvm::GlobalValue::getParent(), llvm::max(), and llvm::CallingConv::SPIR_KERNEL. Referenced by llvm::AMDGPUMachineFunction::AMDGPUMachineFunction(), getImplicitArgNumBytes(), and getKernArgSegmentSize(). Returns the offset in bytes from the start of the input buffer of the first explicit kernel argument. Definition at line 203 of file AMDGPUSubtarget.h. References getMaxFlatWorkGroupSize(), getMaxWavesPerEU(), getMaxWorkGroupsPerCU(), getMinFlatWorkGroupSize(), getMinWavesPerEU(), and isAmdHsaOrMesa(). Referenced by llvm::AMDGPUTargetLowering::analyzeFormalArgumentsCompute(), llvm::AMDGPUTargetLowering::getImplicitParameterOffset(), getKernArgSegmentSize(), and llvm::AMDGPUCallLowering::lowerFormalArguments(). Subtarget's default pair of minimum/maximum flat work group sizes for function F, or minimum/maximum flat work group sizes explicitly requested using "amdgpu-flat-work-group-size" attribute attached to function F.
Subtarget's default values if explicitly requested values cannot be converted to integer, or violate subtarget's specifications. Definition at line 287 of file AMDGPUSubtarget.cpp. References llvm::Default, llvm::Function::getCallingConv(), getDefaultFlatWorkGroupSize(), llvm::AMDGPU::getIntegerAttribute(), llvm::AMDGPU::getIntegerPairAttribute(), llvm::GCNSubtarget::getMaxFlatWorkGroupSize(), and llvm::GCNSubtarget::getMinFlatWorkGroupSize(). Referenced by getMaxLocalMemSizeWithWaveCount(), getOccupancyWithLocalMemSize(), getWavesPerEU(), isCallPromotable(), makeLIDRangeMetadata(), and llvm::SIMachineFunctionInfo::SIMachineFunctionInfo(). Number of bytes of arguments that are passed to a shader or kernel in addition to the explicit ones declared for the function. Definition at line 232 of file AMDGPUSubtarget.h. References F(), getExplicitKernArgSize(), llvm::AMDGPU::getIntegerAttribute(), getKernArgSegmentSize(), and isMesaKernel(). Definition at line 448 of file AMDGPUSubtarget.cpp. References llvm::alignTo(), getAlignmentForImplicitArgPtr(), getExplicitKernArgSize(), getExplicitKernelArgOffset(), and getImplicitArgNumBytes(). Definition at line 193 of file AMDGPUSubtarget.h. Referenced by getMaxLocalMemSizeWithWaveCount(), getOccupancyWithLocalMemSize(), hasAnyNonFlatUseOfReg(), and isCallPromotable(). Maximum flat work group size supported by the subtarget. Implemented in llvm::R600Subtarget, and llvm::GCNSubtarget. Return the amount of LDS that can be used that will not restrict the occupancy lower than WaveCount. Definition at line 240 of file AMDGPUSubtarget.cpp. References getFlatWorkGroupSizes(), getLocalMemorySize(), llvm::GCNSubtarget::getMaxWavesPerEU(), and llvm::GCNSubtarget::getMaxWorkGroupsPerCU(). Referenced by llvm::GCNSubtarget::dumpCode(), and isCallPromotable(). Maximum number of waves per execution unit supported by the subtarget and limited by given FlatWorkGroupSize. Definition at line 225 of file AMDGPUSubtarget.h. Maximum number of work groups per compute unit supported by the subtarget and limited by given FlatWorkGroupSize. Minimum flat work group size supported by the subtarget. Minimum number of waves per execution unit supported by the subtarget. Return the maximum wavecount if the given LDS memory size is the only constraint. Definition at line 250 of file AMDGPUSubtarget.cpp. References getFlatWorkGroupSizes(), getLocalMemorySize(), llvm::GCNSubtarget::getMaxWavesPerEU(), llvm::GCNSubtarget::getMaxWorkGroupsPerCU(), and llvm::max(). Referenced by getOccupancyWithLocalMemSize(), llvm::SIRegisterInfo::getRegPressureLimit(), isCallPromotable(), and llvm::SIMachineFunctionInfo::limitOccupancy(). Definition at line 263 of file AMDGPUSubtarget.cpp. References llvm::MachineFunction::getFunction(), llvm::MachineFunction::getInfo(), and getOccupancyWithLocalMemSize(). Definition at line 189 of file AMDGPUSubtarget.h. Referenced by llvm::SIMachineFunctionInfo::allocateSGPRSpillToVGPR(), buildMUBUFOffsetLoadStore(), llvm::SIFrameLowering::eliminateCallFramePseudoInstr(), llvm::SIRegisterInfo::eliminateFrameIndex(), llvm::SIFrameLowering::emitEpilogue(), llvm::SIFrameLowering::emitPrologue(), getDefaultFlatWorkGroupSize(), hasAnyNonFlatUseOfReg(), llvm::SIRegisterInfo::restoreSGPR(), and llvm::SIRegisterInfo::spillSGPR(). 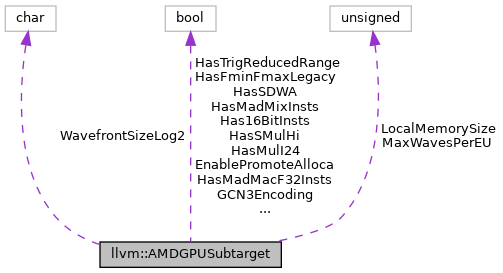 Subtarget's default pair of minimum/maximum number of waves per execution unit for function F, or minimum/maximum number of waves per execution unit explicitly requested using "amdgpu-waves-per-eu" attribute attached to function F.
Subtarget's default values if explicitly requested values cannot be converted to integer, violate subtarget's specifications, or are not compatible with minimum/maximum number of waves limited by flat work group size, register usage, and/or lds usage. Definition at line 317 of file AMDGPUSubtarget.cpp. References llvm::Default, getFlatWorkGroupSizes(), llvm::AMDGPU::getIntegerPairAttribute(), llvm::GCNSubtarget::getMaxWavesPerEU(), llvm::GCNSubtarget::getMinWavesPerEU(), and llvm::Function::hasFnAttribute(). Referenced by isCallPromotable(), and llvm::SIMachineFunctionInfo::SIMachineFunctionInfo(). Definition at line 141 of file AMDGPUSubtarget.h. Referenced by llvm::AMDGPULegalizerInfo::AMDGPULegalizerInfo(), fp16SrcZerosHighBits(), getMad64_32(), llvm::SITargetLowering::getNumRegistersForCallingConv(), llvm::SITargetLowering::getRegisterTypeForCallingConv(), getSplatConstantFP(), llvm::SITargetLowering::getVectorTypeBreakdownForCallingConv(), llvm::AMDGPUTargetLowering::isFAbsFree(), llvm::SITargetLowering::isFMAFasterThanFMulAndFAdd(), llvm::AMDGPUTargetLowering::isFNegFree(), llvm::AMDGPUTargetLowering::isFPImmLegal(), llvm::SIInstrInfo::isInlineConstant(), isNegativeOne(), llvm::AMDGPUTargetLowering::isTruncateFree(), llvm::SITargetLowering::isTypeDesirableForOp(), llvm::AMDGPUTargetLowering::isZExtFree(), llvm::AMDGPUTargetLowering::LowerFP_TO_SINT(), llvm::AMDGPUTargetLowering::LowerFP_TO_UINT(), llvm::AMDGPUTargetLowering::LowerSINT_TO_FP(), llvm::AMDGPUTargetLowering::LowerUINT_TO_FP(), llvm::AMDGPUTargetLowering::performFAbsCombine(), llvm::AMDGPUTargetLowering::performMulCombine(), and llvm::SITargetLowering::SITargetLowering(). Definition at line 177 of file AMDGPUSubtarget.h. Definition at line 149 of file AMDGPUSubtarget.h. Referenced by llvm::SITargetLowering::denormalsEnabledForType(), getFPMode(), getFPTernOp(), getLoadExtOrTrunc(), isClampZeroToOne(), llvm::SITargetLowering::isFMAFasterThanFMulAndFAdd(), llvm::SITargetLowering::isFPExtFoldable(), llvm::AMDGPUTargetLowering::LowerDIVREM24(), llvm::AMDGPUTargetLowering::LowerUDIVREM64(), llvm::R600TargetLowering::R600TargetLowering(), and llvm::SITargetLowering::SITargetLowering(). Definition at line 153 of file AMDGPUSubtarget.h. Definition at line 173 of file AMDGPUSubtarget.h. Referenced by llvm::SIRegisterInfo::eliminateFrameIndex(), llvm::AMDGPUTargetLowering::isConstantCostlierToNegate(), llvm::SIInstrInfo::isInlineConstant(), and shrinkScalarLogicOp(). Definition at line 145 of file AMDGPUSubtarget.h. Definition at line 165 of file AMDGPUSubtarget.h. Referenced by llvm::AMDGPUTargetLowering::performMulCombine(), and llvm::AMDGPUTargetLowering::performMulhsCombine(). Definition at line 169 of file AMDGPUSubtarget.h. Referenced by llvm::AMDGPUTargetLowering::performMulCombine(), and llvm::AMDGPUTargetLowering::performMulhuCombine(). Definition at line 157 of file AMDGPUSubtarget.h. Referenced by findSingleRegDef(), llvm::AMDGPUTargetLowering::PerformDAGCombine(), and llvm::SIInstrInfo::verifyInstruction(). Definition at line 181 of file AMDGPUSubtarget.h. Definition at line 161 of file AMDGPUSubtarget.h. Referenced by llvm::AMDGPULegalizerInfo::AMDGPULegalizerInfo(), findUser(), getSplatConstantFP(), llvm::AMDGPUTargetLowering::isFNegFree(), and llvm::SITargetLowering::SITargetLowering(). Definition at line 137 of file AMDGPUSubtarget.h. Referenced by llvm::SIFrameLowering::emitEntryFunctionPrologue(), llvm::AMDGPUAsmPrinter::EmitFunctionBodyStart(), getExplicitKernelArgOffset(), parseTexFail(), reservePrivateMemoryRegs(), and llvm::SIMachineFunctionInfo::SIMachineFunctionInfo(). Definition at line 121 of file AMDGPUSubtarget.h. Referenced by llvm::AMDGPUAsmPrinter::EmitFunctionBodyStart(), getAlignmentForImplicitArgPtr(), llvm::GCNSubtarget::getTrapHandlerAbi(), hasAnyNonFlatUseOfReg(), llvm::GCNSubtarget::hasCodeObjectV3(), llvm::GCNSubtarget::initializeSubtargetDependencies(), isAmdHsaOrMesa(), llvm::SITargetLowering::LowerFormalArguments(), parseTexFail(), and llvm::AMDGPUAsmPrinter::runOnMachineFunction(). Definition at line 125 of file AMDGPUSubtarget.h. Referenced by llvm::SIFrameLowering::emitEntryFunctionPrologue(), llvm::SITargetLowering::LowerFormalArguments(), and llvm::AMDGPUAsmPrinter::runOnMachineFunction(). Definition at line 129 of file AMDGPUSubtarget.h. Referenced by llvm::GCNSubtarget::isMesaGfxShader(), and isMesaKernel(). Definition at line 133 of file AMDGPUSubtarget.h. References llvm::Function::getCallingConv(), isMesa3DOS(), and llvm::AMDGPU::isShader(). Referenced by getImplicitArgNumBytes(), and isAmdHsaOrMesa(). Definition at line 185 of file AMDGPUSubtarget.h. Definition at line 365 of file AMDGPUSubtarget.cpp. References F(), getFlatWorkGroupSizes(), llvm::Function::getIntrinsicID(), llvm::Instruction::getParent(), llvm::BasicBlock::getParent(), if(), llvm::CodeModel::Kernel, and LLVM_FALLTHROUGH. Referenced by getMaxWavesPerEU(), and INITIALIZE_PASS(). Definition at line 75 of file AMDGPUSubtarget.h. Definition at line 67 of file AMDGPUSubtarget.h. Referenced by hasFP32Denormals(), and llvm::R600Subtarget::initializeSubtargetDependencies(). Definition at line 68 of file AMDGPUSubtarget.h. Definition at line 65 of file AMDGPUSubtarget.h. Definition at line 74 of file AMDGPUSubtarget.h. Referenced by hasFminFmaxLegacy(), and llvm::GCNSubtarget::initializeSubtargetDependencies(). Definition at line 73 of file AMDGPUSubtarget.h. Definition at line 66 of file AMDGPUSubtarget.h. Definition at line 71 of file AMDGPUSubtarget.h. Referenced by hasMulI24(), and llvm::R600Subtarget::initializeSubtargetDependencies(). Definition at line 72 of file AMDGPUSubtarget.h. Referenced by hasMulU24(), and llvm::R600Subtarget::initializeSubtargetDependencies(). Definition at line 69 of file AMDGPUSubtarget.h. Definition at line 76 of file AMDGPUSubtarget.h. Definition at line 70 of file AMDGPUSubtarget.h. Definition at line 77 of file AMDGPUSubtarget.h. Referenced by getLocalMemorySize(), and llvm::GCNSubtarget::initializeSubtargetDependencies(). Definition at line 78 of file AMDGPUSubtarget.h. Referenced by getWavefrontSize(), llvm::GCNSubtarget::getWavefrontSizeLog2(), and llvm::GCNSubtarget::initializeSubtargetDependencies().